Need a Swing Gate Opener for your home or other residential application? Gate Openers Direct offers residential swing gates operators from major manufactures such as Nice Apollo, Doorking, Chamberlain, Liftmaster, FAAC, Viking Access and more. Swing gate openers open inward or outward from a hinge point. Swing gate operators come in three major types: ram arm, articulating arm, and underground gate operator. A ram arm is located on the gate and post and uses a piston that travels in and out. An articulating operator, which is a box, that sits off to the side and has an arm extending to the gate. Underground operators use the hinge and operate the gate via a link arm. Rarely in the gate opener and operator industry is an internet company able to cover openers and operators under a factory warranty. Most online resellers buy, at discount, in bulk from the distributors then resell with no technical personal support offered. As a result, the manufacturers will NOT honor the warranty on openers and operators sold in this manner because the purchaser has no access to competent technical support. Major manufacturers like Viking, Liftmaster, Apollo, Doorking, FAAC and others plainly state this on their factory website home page. Apollo Swing Gate Openers and Apollo Swing Gate Operators are some of the best solar gate openers sold anywhere in the world; but, if purchased online from a "box pusher" who provides no technical support, then no warranty ! We have factory warranties on all our products. If you have any questions please give us a call at 877-688-GATE or contact us by e-mail. The FAAC Model 412 electromechanical swing gate opener is designed for light duty, single family res.. The Ramset RAM 30 is the perfect residential swing gate operator when you need a small affordable re.. 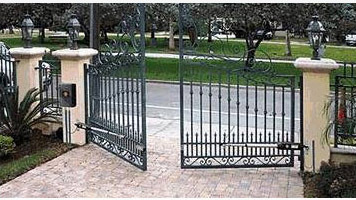 Ideal for both residential and commercial swing gate operator applications. The Ramset RAM 300.. The robust RAM 3000 series features Ramset's strongest and most powerful operators, able to swing a .. The Linear/OSCO LRA Linear Residential Actuator is designed to open and close a light-duty residenti.. The OSCO SWR Residential 1/2 HP Swing Gate Operator is built for gates up to 17 ft. and 500 lbs. The.. The OSCO SWR Residential 1/2 HP Swing Gate Operator is built for gates up to 17 ft. and 500 lbs. &nb.. Linear OSCO SWD series is a Commercial / residential duty swing gate operator with DC battery backup..
USAutomatic Partriot Swing Gate OpenerThe USAutomatic Partriot Swing gate is the gate operator of ch..